Wall Street’s best quarter in years will come with a large asterisk. How big may determine where stocks are headed next. In a little more than a week, publicly traded companies will begin reporting their results from the first three months of the year. It’s expected that they will be incredibly good. Even great. Earnings growth for the companies in the S&P 500 Index is estimated to have risen 17 percent in the first quarter, the largest jump in profits since the first quarter of 2011. That performance, however, may not be as good as it seems. That’s because a big source of the surging profits is coming not from increased sales or lower costs or even a better economy but from taxes. It will be the first quarter that fully incorporates the benefits companies are receiving under the new tax law, which President Donald Trump signed late last year. Investors won’t have a full picture until every company has reported, and even then it probably won’t be completely clear. Few companies, because of exemptions and overseas earnings, paid the old 35 percent rate. Analysts now expect companies in the S&P 500 to earn a collective $36.54 a share, up from $34.50 a share in mid-December, before the tax bill was passed. Exclude that gain and the non-tax-related earnings growth of the S&P 500 will be 11 percent, not 17 percent, in the first quarter. But that might also miss the mark. By mid-December, some analysts were already factoring in a tax cut. What’s more, some of the earnings increase could be attributed to generally improving outlooks for some companies. The fourth quarter, which was not yet reported in mid-December, may have caused some analysts to raise or lower their estimates. And this confusion is going to be with investors for a while. Analysts expect earnings to grow in the high double digits for the rest of the year and 20 percent for all of 2018, but that again includes the tax gains. 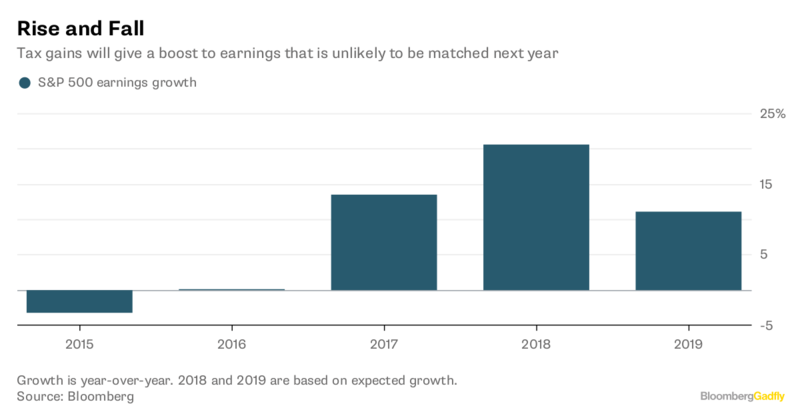 By next year, when the tax gains will not be new, the average earnings gain for the companies in the S&P 500 is expected to drop to just more than 11 percent. And there are some other signs that profits may not be as great as they seem. On Thursday, Bank of America Merrill Lynch said its earnings revision ratio, which compares the number of estimates that have risen with those that have fallen, dropped in March for the first time in four months. What’s more, the number of companies that are providing negative guidance is rising, though it is still lower than the number of companies that are indicating that earnings will be better than expected. Despite all the expected good earnings news, the market has had a rocky quarter. Nonetheless, the average stock in the S&P 500 still trades at a multiple of nearly 17 times next year’s earnings. Stocks do tend to trade at price-to-earnings multiples above their growth rate, but not much. If the actual earnings growth turns to be much lower than that, rocky could turn into an avalanche in a hurry.